It was one of those warm, quiet, sunny August mornings so peaceful and delightful to the war-worn, blue-coated boys enjoying their period of convalescence and respite from the horrors of France. Dear old Blighty! How we we love you! How we enjoy the welcomeÂ of your homes, the beauty and quiet of your country, the security and refuge that you afford. Security, surely, for far, far away sounded the rumble of the great guns, so distant, so muffled, as of some far-off thunder, and seeming only to add to the feeling of repose. Does not that broad strip of water, upon whose calm, unruffled surface the little boats were dancuing so merrily that morning, their sails gleaming in the bright August sunlight, lie between us and the hell of war? Are not the cliffs of old Albion bristling with the muzzles of a thousand guns, a grim and silent warning to all who would violate the sacredness of British soil? But stronger and surer even than these, we put our trust in those who form that solid khaki line, fighting and dying somewhere in France, that the Motherland may live. Yes, surely our defences are well assured and we had nothing to fear. On the morning that I have spoken of, I was working in the office with McLennan. It was nearly four months since I had got my â€œBlighty,â€ and I was still in the hospital blues. A Mauser rifle bullet through the elbow naturally puts a fellow out of the running for a time. There was little to do in the office, and Mac and I, intoxicated with the drowsy quiet of the morning, were sitting lazily back in our chairs discussing the war, of course, particularly the submarine menace, and attributing to it our meagre breakfast of porridge and prunes. Suddenly, a long-drawn, terrifying howl broke the quiet of the morning. â€œAn air raid,â€ shouted McLennan. We jumped up and ran out into the hospital quadrangle. The terrific sound that had so startled us was the electric siren on the seafront, giving its dreaded warning that the Boche, in his bitter hate and fiendish cruelty, was again about to â€œstrafeâ€ our little seaside town, to wage his inexcuseable war on defenceless women and children, and wounded Canadian soldiers. In a few minutes the quadrangle was filled with blue-coated patients, all looking skyward, trying to catch a glimpse of the messengers of death in the clear, blue summer sky. We had not long to wait. Far across to seaward we soon discerned a squadron of ten aeroplanes, flying inland at a great height. There was no mistaking their identifty, the patches of bursting shrapnel, smoke all around, from our anti-aircraft guns, telling us that they were the Huns. As they came closer, all our batteries along the shore opened up with a deafening roar, and round upon round of bursting shrapnel was sent into the formation of the marauders, punctuated at times by the sharp rattle of our machine guns, as the enemy was engaged by our airmen. We who were watching from below stood gazing at the awe-inspiring spectacle as if hypnotized by those sinister, swiftly-moving specks far up in the blue, On and on they came, so deliberately, with such persistency and grim determination. How perfectly they kept their formation unbroken, despite the terrific fire of our guns. Defying every danger, intent only upon their murderous purpose, they flew directly for the town. Asthey drew inland, they dropped to an altitude of about 10,000 feet and thus we were able to view them quite distinctly. 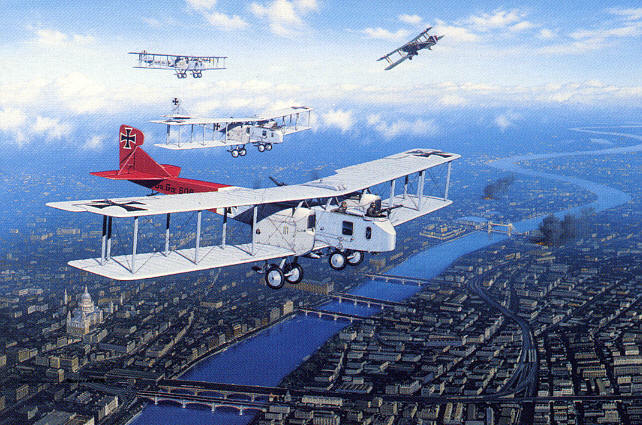 They were huge machines, bi-planes of the latest Gotha type. For several minutes we watched them, scarcely able to relaize that in a few moments they would be above us, dropping their horrible death machines into our midst. As a serpent is said to charm a bird, so we seemed under the spell of these rapidly approaching planes. Then suddenly came that horrible screech of a bomb whirling through the air, followed by a deafening explosion. Then, no longer were we under the spell of the Hun machines. For we who had been in France knew only too well that horrifying noise, and in a moment the watching crowd of blue-coated men was turned into a panic-stricken mob, running hither and thither, vainly trying to get out of the path of the death-dealing formation above. But go whichever way we would, the Gothas in their zig-zag course seemed to follow. Someone shouted an order to keep out of sight under trees, but there was no controlling that scurrying, excited mod of wounded soldiers. Six months in the trenches will ruin the nerves of most men, and we chaps, all of whom had been under shellfire and through the fight, knew only too well the blasting effect of German high explosives. With an instinct gained in France, we looked for a dugout, and failing to find one, took cover under an availing shelter, no matter how small or frail. As I ran blindly, hardly knowing where, I found myself confronted by the high stone wall surrounding the hospital. I could see no escape that way, and now, how close sounded those horrible screams and terrific explosions! I dared hardly to look up, and each moment added to the awful nerve-wracking suspse. Then in a moment it seemed that a torpedo was about to drop where we stood. My God! Had I escaped a soldierâ€™s death in France, only to be killed by those fiends in dear, old Blighty? This, and a hundred other thoughts tore through my mind in the moment when it seemed inevitable that the bomb we heard screaming through the air so close, would surely drop where we stood. But it exploded on the open ground of a tennis court some fifth yards away. I felt the terrific concussion, saw the great cloud of earth and debris hurled into the air, and heard the chunks of iron shrapnel zipping through the air. I think no obstacle could have stopped me then. One leap at that stone wall and I dropped into the grass of an old churchyard on the other side. A couple of other chaps followed me, and in a frenzy of fear we all ran blindly forward. Explosion after explosion followed. None of us, I think, dared to look up, fearful lest the aeroplanes had changed their course and were following. Seeing no other way in front of us, we ran out of the churchyard, through someoneâ€™s house, shouting for a cellar, but were met on every hand by locked doors. Then out into the schoolyard, and on the far side I saw a basement window open at the top. The other boys went over the school wall and found shelter, I know not where. I climbed through the narrow opening in the window, and sat in a corner of the cellar, listening to the roar of our guns and the sound of the exploding bomb, which seemed, however, to be getting farther and farther away. Then I looked out, and my fears vanished. Two of the great Gothas were falling in a mass of flames, and a third was tumbling over and over out of all control. From one of the burning machines, I saw a man leap with a parachite, but in a moment the parachute burst into flames and the Hun was hurled to the earth from a height of nearly two miles. Truly a horrible death, yet a just one for these barbarians. The remainder of the formation was veering off to seaward again, having been turned by the terrific fire of our guns. I knew that the danger was past, but it took a few minutes to get control of my nerves again sufficiently to leave the shelter. I did not have far to go to find the results of the raid. Most of the houses in the precincts of the hospital had their windows shattered. When I got back to the hospital, it was quite clear what mark the Hun had taken to vent his hate upon. In accordance with his usual ruthlessness, it was the building displaying the Red Cross flag that had been marked for destruction, and only too well had the work been done. In one place, where out-of-door patients were kept, a bomb had dropped into the centre of a cluster of tents, reducing the whole place to an almost unrecognizeable pile of smoking wreckage. Coming over to the hospital,Â I found one end almost completely ruined. An aerial torpedo had been dropped on this part of the building. It had penetrated the roof and four floors before exploding in the basement. The terrific explosion had wrecked the recreation room above, and the chapel immediately above it., leaving nothing but a heap of wreckage and the strong stone walls; all within was blown to atoms. Other bombs fell on the grounds doing but little damage. There were but two fatalities among the patients, and six wounded. The casualties would have been very heavy, only that the hospital had been cleared of patients on the first intimation of danger. In the town, only minor damages had occurred; most of the death machines had been reserved for the wounded soldiers. But it took some time for the excited townspeople to overcome their fears. When they could realize that, for that day at least, the danger was passed, the expressions of fear gave way to those of hatred, and a demand for revenge.Â Nowhere in Ramsgate could anyone be found who would say â€œnoâ€ to reprisals, and it is the same in every town that has suffered from this form of Hun frightfulness. â€œNo reprisalsâ€ is the phrase of those who have not suffered, but even as the kaiser must be taught the word, â€œreparations,â€ so must those in authority here learn the word â€œreprisal,â€ and carry this warfare, inhuman though it is, to the very hearths of the German people. We have made reprisals in the trenches, and there the Hun has been met on equal ground with his ownÂ instruments of warfare. Why should the women, the children, the aged and the wounded in the Motherland not receive the same protection? Very vivid account. It gave me some chills to read the writings from a man who witnessed the terror of war first hand. Ian Andrew Bell has been bending bits into business since 1993. He is the creator of @Tingle, @RosterBot, and other things celebrated and ignominious. He is also a Hockeyist, Motorcyclist, and Aviation Enthusiast. Follow him on twitter as @ianb or find him on LinkedIN.